Great for students and professionals alike. Quite suburb, close to town with lots of living space. Very spacious outdoor and indoor living areas. Two story house with views across town. Plenty of space for everyone to do their own thing Accessible to all universities throughout Ballarat. With quick access to M8. close to the the sporting facilities and gyms. A bike ride to the lake. It is close to stockland shopping center and railway station to go to Melbourne. Bus stop in front of the property. Brand new townhouse so it is absolutely clean. Will be sharing with a matured professional single male who works in Melbourne so you will have the property to yourself until late evening. Very relaxed house. The landlord cleans the house weekly. You would have you own ground floor bedroom with heating in room, private bathroom and own lounge room with tv. Just off Lake Wendouree with bus exchange across the road with direct route to Ballarat city. A teacher in her 50s, a middle-aged social worker, and engineer four nights/week (daughters in their 20s occasionally visit from university) etc. Bedroom is fully furnished with single bed, bedside table, desk, drawers, bookshelf, built in wardrobe etc. 18-year-old comfortable house, in a quiet court with cycle link, near schools, recreational and wetland reserves, five minute walk to bus stop. Main bathroom, laundry, kitchen, two living areas, sunny rumpus room and outdoor area. Loads of fruit trees and berries - in summer and autumn. Beautiful piano, solar electricity, gas-boosted solar hot water and gas central heating. Rent includes electricity, water and internet (gas bills are divided evenly in the cooler months). Ideal for an additional FIFO professional or independent, mature student; consideration for sustainability appreciated. Pretty flexible arrangements make this a relaxed, respectful household, however, no racism or Trump admirers will be tolerated. Feel free to make contact, thank you. Perfect for responsible, tidy professional/student (with 1 quiet occupant) - renovated home near lake. Large bedroom, new paint and carpet. Two living areas, outdoor entertaining with low maintenance garden. Share utility bills (approx. $30/wk each). 5 min walk to hospitals; ACU. NBN connected. Furnished/unfurnishrd - wardrobe, dressing table inc, BYO bed/mattress. 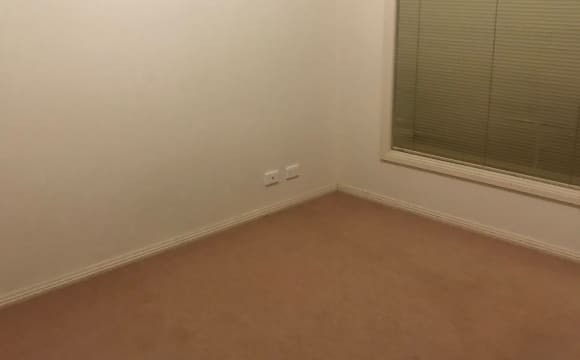 Furnished double room for rent in Soldiers Hill North, Ballarat. Room includes queen bed, 1 x bedside table and 1 lowboy drawer. 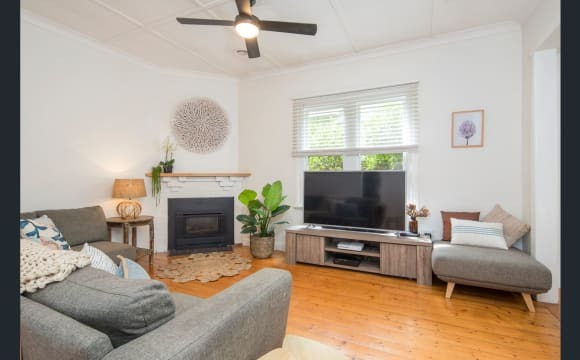 The house itself is 3-bedroom, 1-bathroom, 1-toilet, fully furnished complete with a washing machine, lounge suite, TV, NBN internet, dining table, microwave etc. It has a beautiful patio at the rear of the house, which is beautiful to enjoy with a cuppa or friends. Ample internal storage and parking space in the driveway if you have a vehicle. 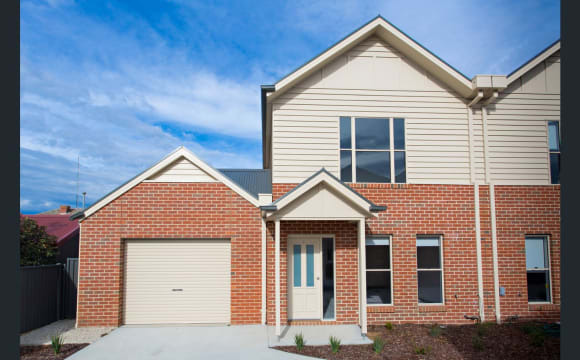 The property is 4 minutes away from Aldi supermarket, Bunnings, Ballarat CBD, Ballarat Railway station. There are 3 cafes and 2 pubs within 500m of the house, a bookshop on the corner, hairdressers at the end of the street, 30-second walk to the post office. 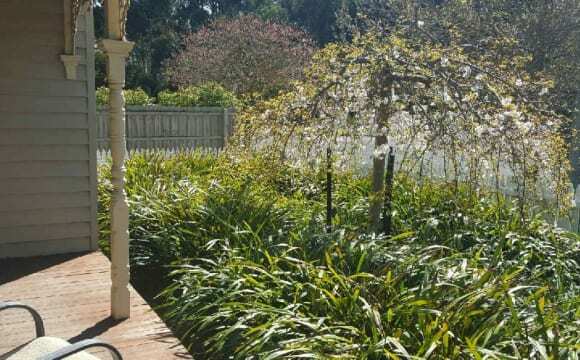 Close to Lake Wendouree and Ballarat Showgrounds. The house is located within the Uber radar so you can easily get Uber Eats delivered to the house or have an Uber pick you up/drop you off. Quiet, safe area that is close to public transport and local amenities. Central heating and air conditioning. Everything you need is included you just need to bring your own linen, pillow, doona and towels. Currently have two rooms available in my house. 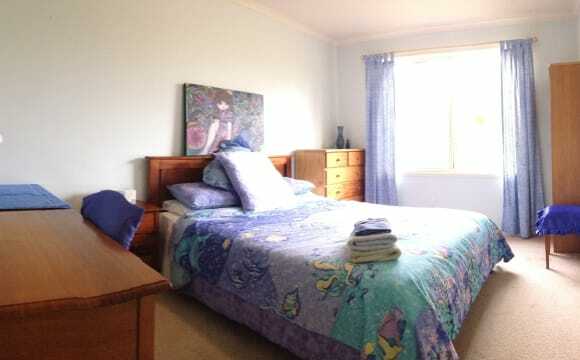 Very central, 5 minute walk to CBD or lake. Please feel to call me if you have any questions. Ben. Great location in Ballarat central. Small back yard. Walking distance to shops and cafes. Professional female seeks professional housemate to share house city centre. Absolute class offered in this fully renovated ....fully furnished (except for bedroom) and very ambient city centre property. Two living areas ... one with open loft style living space and heaps of natural light and luxurious 8 seat leather sofa. The other more intimate and home theatre style. Both with huge wall mounted 75 inch HD flatscreen smart TV''s and the internet streaming apps Netflix and Stan. House has a chefs style kitchen with fully automatic Saeco espresso machine and quality appliances including huge smeg oven and euromaid dishwasher, two smeg microwaves and solid stone bench tops. House has carpeted bedrooms and lovely polished hardwood throughout so great for allergy sufferers. House has central heating so very cosy in winter and aircon and ceiling fans so cool in summer. Laundry : Washer, Dryer, drying and airing cupboard and ironing centre. Included also is a separate outdoor entertainment/games room external from the house with a bar fridge and pool table aswell as a full undercover back deck with 6 seater table and outdoor chairs. 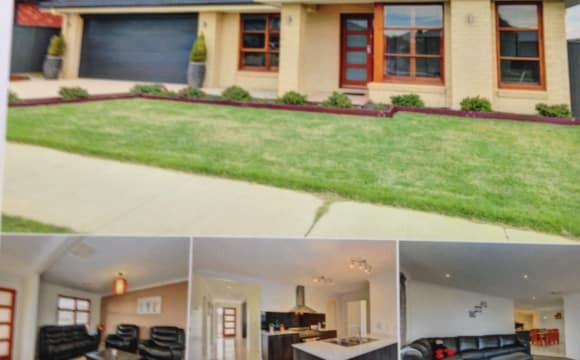 House is 1km to lake wendouree and 4 blocks to city centre, sturt st, colleges and hospitals and one block to public transport. House is connected to fastest speed NBN internet. Bills not included in price. Contact anytime for an inspection. The propert is close to the hospital and the city, both in walking distance. There is both heating and cooling, and wifi available. Hi The listing is a huge, funky apartment right in the centre of Ballarat's cbd, in fact, it would be hard to be more central! Imagine living above the row of shops opposite the Town Hall with the bus stop at the door and Ballarat's prime eating places alongside! The apartment is fully furnished and includes a double drawer dishwasher, large washing machine, linen and a fully fitted out kitchen. Currently, there are four professionals living there and we're looking for one more. We'd prefer long term people who are clean, responsible and easy to get along with. It works because everyone is respectful and clean and because the apartment is so large. In fact, it is so large that there is space for most of us to have their own separate office at no extra charge! That's two rooms for the price of one! NBN is connected so the internet is super fast. You'll be 25 plus, a non-smoker and a professional. Supermarkets, ACU university and both hospitals are within walking distance so there is no need for a car. The bus stops at the door to Fed Uni and everywhere else. Two Story Town House in Redan. less than 1 minute walk to Anytime Fitness, Maxi Foods and IMO the best noodle shop in Ballarat! The house is furnished except for the bedroom. 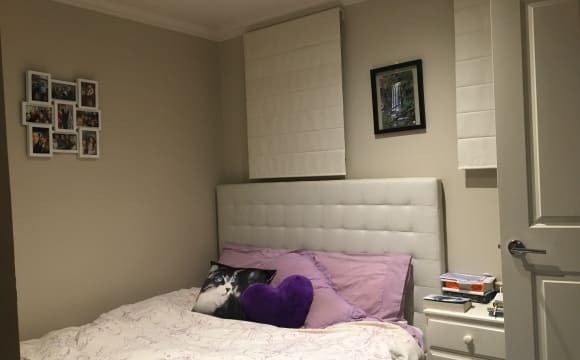 2 medium sized bedrooms with BIR, 1 unfurnished (would consider furnishing if required) and 1 currently furnished (furniture could be removed if required). You will have a shared bathroom that will only need to be shared between 2 people, as I have an en-suite. Parking off street can be discussed. 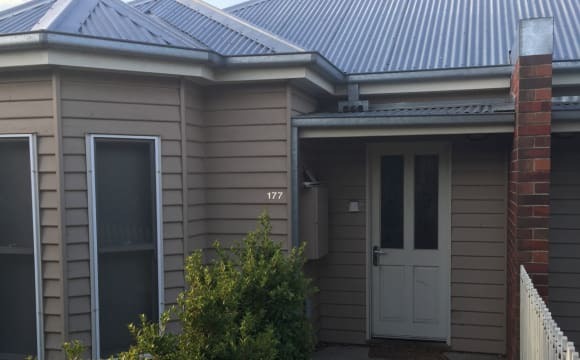 House is located in very central location, in Ballarat East only 1.5kms to the station and shopping center, 5 min drive into town &amp; 2 min walk to bus stops. Include: Foxtel, Internet, Electricity, Gas, Cleaner, Water, No couples preferred please. 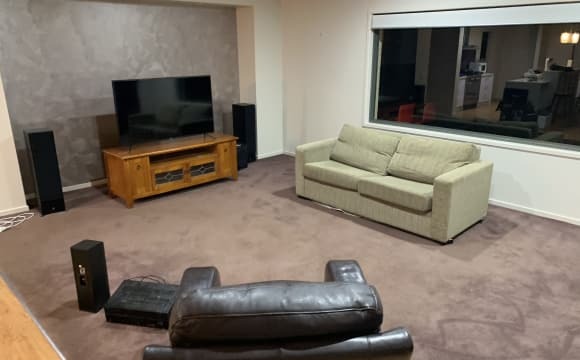 Looking for a professional(s), who is able to contribute to keeping the house neat and tidy and who enjoys a quiet space after a stressful day (if your looking for regular parties this may not be the house for you) About me: I work full-time as an IT Professional, and work from Melbourne 3-4 days per week, my spare time is generally spent either at the gym, training, seeing friends and catching up on books and movies. Any questions, please shoot me a message. 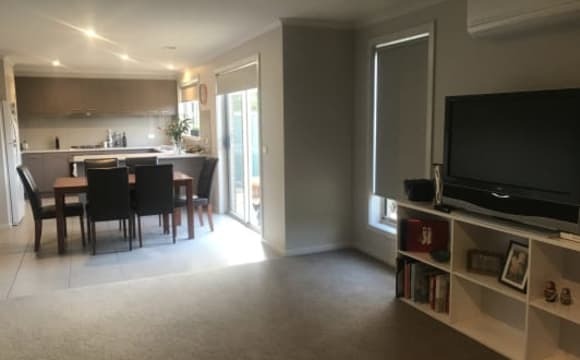 This house is located very centrally with Sturt St, Woolworths, Coles, Bridge St Mall, Big W, Bridge Street bus exchange and Central Square all within walking distance. 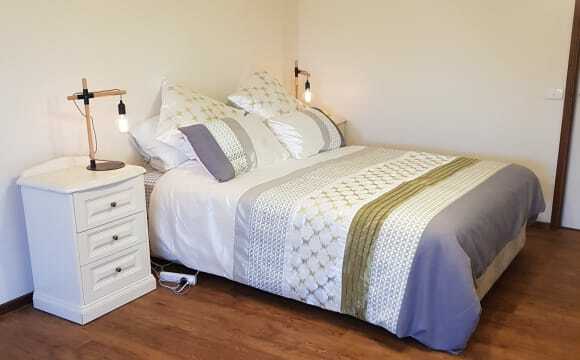 The unit is a two bedroom stand-alone unit at the back unit of a block of five away from the street with a small backyard and outdoor clothesline. The house is fully furnished apart from the spare bedroom with a washing machine and TV. The house has an excellent gas heating unit and unlimited internet for $30 a month. All other bills will be split evenly. The garage is empty and free for use as I don't have a car. Handy to everything, mins to shops and public transport. Beautiful large garden courtyard. Quiet and private. Our 3 bedroom home is in a good location close to town and right next to a takeaway, hairdressers &amp; a fruit shop. There is also a service station in walking distance. We have an already furnished living area with a gas heater. We also have an outdoor living area including a BBQ &amp; spa. Unlimited cable internet and all utilities are also included in rent. Your bedroom will come unfurnished. Quiet 2 bedroom flat in a block of 3 flats. 20 minute walk to Lake Wendouree, Bus Stop 1 minute away.